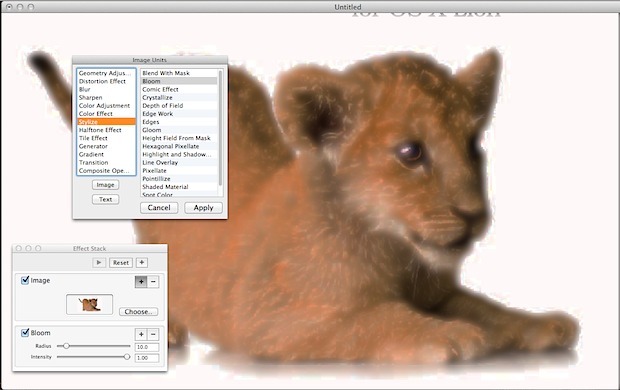 This is a small program designed to showcase to programmers OS X’s built-in visual effects, but it also lets anybody apply the effects to images. It’s rather like options typically offered on the Filters or Effects menu of popular image editing apps. When the program runs, you’ll be prompted to open an image. Once you do so, a floating palette window will let you choose effects to apply (if the palette isn’t visible, click Window->Effect Stack). Simply click the plus button alongside the Image checkbox to bring up a list of effects you can apply to the image. Most of the effects typically found in image editing apps are offered, and once applied, the program will also offer a variety of sliders that will let you adjust the intensity or nature of the effect. When you’ve finished applying effects, click File->Save As and give the changed file a new name. The effects look terrible though, nobody would use this for image modification.